Northumberland County Council has sought to reassure residents about the level of green-belt protection surrounding Morpeth following the decision to withdraw the core strategy from Government. The Conservative group, which is now in charge at County Hall, put forward a motion that also asked planning officers to undertake a full review of the housing and employment numbers, and strategic land use allocations, for the local plan. It covers the period up to 2031. The withdrawal came into effect after a majority of members supported it at a full council meeting earlier this month – 39 councillors were in favour, 22 were against and two abstained. This led to Morpeth town councillor Andrew Tebbutt, on behalf of the local authority, asking for clarification about the implications for future development within and adjacent to Morpeth at last week’s meeting of the Castle Morpeth Local Area Council. Mark Ketley, head of planning services at the county council, said the Morpeth Neighbourhood Plan (MNP) and other policies relating to the Joint Structure Plan and National Planning Policy Framework (NPPF) will be referred to in any future relevant development applications and he mentioned two recent appeal decisions to give some context to his reply. Part of Coun Tebbutt’s question was as follows: ‘Given the decision of Northumberland County Council to withdraw the core strategy from public examination, the proposed green-belt extension around Morpeth is no longer under consideration. ‘Morpeth Town Council recognises that the MNP has full weight, but is also conscious that different planning inspectors in considering appeals have placed variable importance on the emerging green-belt proposal. 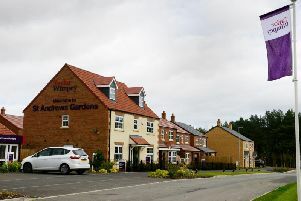 ‘Now the core strategy has been withdrawn, Morpeth Town Council would like clear advice from senior planning officers on the implications for future development proposals within and adjacent to Morpeth. Mr Ketley’s response includes the following: ‘As a recently made (adopted) neighbourhood plan and the most up-to-date development plan document for the area in question, the MNP carries full weight in the determination of planning applications. ‘While the MNP does not in itself deal with green-belt boundaries, it is important to note that saved policy S5 of the Joint Structure Plan establishes the principle of a green-belt extension around Morpeth, with the detailed inner and outer green-belt boundaries to be defined in a future local plan. ‘In the absence of an emerging core strategy, the settlement boundary for Morpeth as identified in the MNP will effectively form the basis of the inner green-belt boundary for all future decision-making during the interim period. ‘As such, any sites falling outwith the defined settlement boundary in the MNP will be classed as proposed green-belt land under Joint Structure Plan policy S5. ‘What is particularly helpful in this context are two appeal decisions – one relating to High House Lane to the west of Morpeth and one relating to land north of Lynebank at Ulgham.